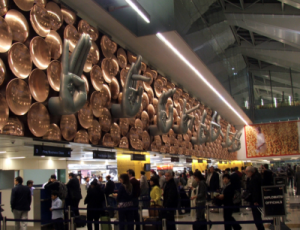 New Delhi Indira Gandhi International Airport (IATA abbreviation: DEL), is the largest airport in India, and carried approximately 40 million passengers in 2014. Recently the new Terminal 3 opened to the capacity of the airport has multiplied. It is one of the 10 largest passenger terminals in the world. Terminals 1 and 2 each consist of three parts, of which some parts are very outdated. International flights use the new Terminal 3. mostly fly-cost airlines on the old airport. It runs every 20 minutes a shuttle bus from Terminal 1D to Terminal 3 and vice versa. This bus is the highway outside the airport and takes quite a long time. The airport is a hub for Air India and Kingfisher Airlines.